Where exactly do we meet, will there be equipment for Ainsley, how much does it cost to run in the race, how do I sign up, is it too late for Ainsley to participate, will they have handicap parking, to name but a few....within a few hours, little did we know, our path of our lives will have changed forever. Lori and the kids had made signs to cheer her on..."Beach ya can't catch us" the sign read. Shortly after arriving, all of the questions and uncertainties had clarity and Ainsley was ready to Roll! We linked up with Peggy introduced us to Trey. 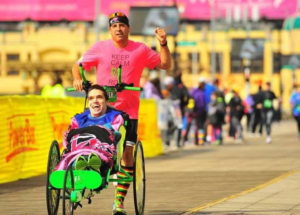 He had recently started the local organization called Team Hoyt VB that provided the runners and chairs for the riders to race in and made all arrangements to make the morning of running possible. We got Ainsley situated, met her pusher, Mike, and headed to the start. Before long, the race director said go and she took off! I had never been to a race before, so I had no clue about registering for a bib. Hence, I was not registered and did not start running. Just as they disappeared out of sight down the oceanfront Boardwalk, Miss Peggy looked at me and said, "I thought you where running!?!?". I said that I don't have one of those sign thingies to put on my shirt. She looked at me and said, well I guess we can just stand here and wait....but, you do know this is a public Boardwalk? Hmmm, I thought, I guess I could go catch up with them (note: my intent was not to be what I know today is a bandit, if fact I frown on that practice). So, I took off down the board walk. As I reached the 1 mile mark, Ainsley had already reached the 1.5 mile turnaround and was approaching me at her mile 2. So, I turned around to run the final mile with her....so I thought. You see, Ainsley was flying! In fact, as the wind blew in her face she was SMILING BIG, as if she realized she was actually in first place! I ran with her for a half mile...at a 6:30 minute mile pace...before turning to the man pushing (Mike) and saying, "don't let me slow you down, go, go go, she loves it and she is going to win!" And with that, he increases tempo and sprinted her home to a first place finish! Yes, she won the race and that was very cool for her first race...BUT, she also won something so much more valuable that a race. 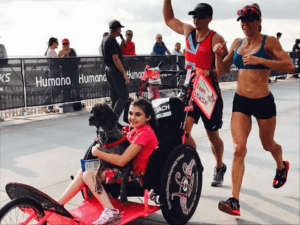 Her first race that day with the newly formed Team Hoyt Virginia Beach was also the first day of the rest of her life, as an ATHLETE! With her smile and her joy, she changed our life forever...8 years later and our family has expanded to and is executing this mission with passion in all corners of the Nation and globe. My story started in 2010 with the birth of our first child, Dalton. On 10/22/10 our lives changed forever. Born with Goldenhar Syndrome, he had a long, tough road ahead. On Fathers Day, 2012 my sweet boy gained his wings in my arms on the side of a highway. I couldn't save the one thing that was my godly duty to protect. I spiraled after that, drinking heavily, uncontrollable anger, I withdrew from life. But...through unimaginable love of my wife, I began to fight back. Running became my vice...my outlet...my passion. Our son Colt was born in the summer of 2013 and at less than a month old we were running together and we are still an unstoppable force on the local trails. My wife and I made a promise after we lost Dalton that we would forever strive to make a difference. This wonderful group encompasses everything I hold most precious. Family...inclusion...charity...and with your help and support I am determined to change lives and minds. Back in June of 2010, I was one of the many recipients of an email from Rooster saying that he and Ainsley would be running in their first half marathon with Team Hoyt VB at the Rock N' Roll Virginia Beach Half Marathon that Labor Day weekend and that they were looking for others to join them as part of Team Ainsley. I immediately emailed back that I was in! Mind you, I had only run 2 5k's before (and not well), had no idea what running a half marathon truly entailed, but I just wanted to see Ainsley again (and her family), as I had not seen them since I was Ainsley's preschool teacher in 2007. I had seen pictures that Lori has sent me with Ainsley racing and it looked like so much fun! When I arrive that weekend and as Rooster drove me to the expo to get my bib and showed me the race course while driving, I literally thought that I would throw up, as I realized just how far 13.1 miles really is! The one thing that I remember him saying though was, "You know Michelle, if I were to ever get stationed back at Camp Lejeune, I would make it a point to start something like this (Team Hoyt-VB) down there." As I arrived with Team Ainsley prior to the race the next morning and looked around at all of the Team Hoyt athletes, I felt so out of place and scared as I realized that all of these people were true "runners"...I was just a preschool teacher who loved the thought of joining Ainsley in this race...not to mention that in the back of my mind I just always figured that it would be a kind of "relay thing"! 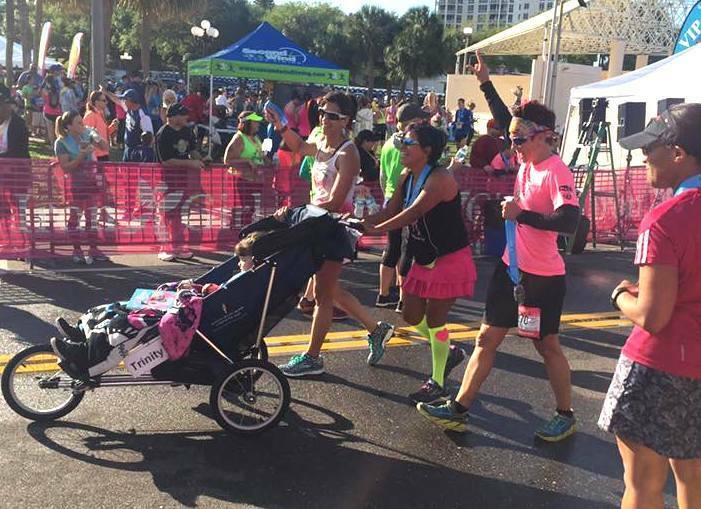 As we jogged from the meeting spot to the starting line, I was able to push Ainsley for the first time and it was something that I will remember forever! I also remember thinking that I was about to pass out from running 3 blocks! At the start line, I was so taken away with the sense of energy that surround all of the team members and with the sense of family that I immediately felt between them all! The race began and Ainsley, Dr. Laura, Rooster, and Andrew flew out of the start! I smiled as I watched them get further and further in front until they couldn't be seen any more. I also met Miss Abbey for the first time and we ran together for maybe the first 2-3 miles before I fell behind her, too. As I ran alone that day, I just kept thinking about how much Ainsley loved all of this and that, yes, this was needed back in our community, like Rooster said. I finished that race that day (and was so excited to see Rooster and Lori and Katy waiting for me there) and from that day forward, the path of my life forever changed! This path has never been about running for me, but instead, it has been about making sure that EVERYONE has a sense of inclusion. I was so proud when in Sept. 2012 (just 2 years later), Ainsley came down to Camp Lejeune to be a part of the first ever team of the 2nd Ainsley's Angels team to form, right here in the town that she was born in! I will forever grateful for that email that Rooster sent, asking for people to join Team Ainsley! I woudn't have missed it for the world! I have 2 special needs sons, Josh and Ryan. During their early years, our time spent together was usually watching TV, movies, sports, stuff like that..not much physical activity or anything exciting. About 4 years ago I decided to lose weight (50lbs) and get myself healthy again, mostly because I wanted to avoid diabetes (told I was borderline diabetic)and I had 3 beautiful children to live long for. I heard friends at work talking about a 10 miler in Philly in 2013 and made that a goal. Killed it! Then a half a few months later followed by a full marathon 8 weeks later. Meanwhile, my son Ryan saw my running and wanted to get involved with the track team at middle school. With the help of an after school aid, he began running and was included with the team. Over the next few years I always thought of how I could get Josh rolling with me. Was always a fan of the Hoyts and knew it was possible. In the spring of 2015 I was introduced to Kim Rooster Rossiter, a fundraiser page was made, the money was raised and then the beginning of Team Josh. We were invited to receive our chair at the MCM, since I was already registered for it. Got the chair, learned about Ainsley's Angels, saw the amazing camaraderie and when approached after about bringing AA to NJ by Rooster, I said I had to think about it. Why think about it? For a few days I couldn't think why I shouldn't bring AA to South Jersey, the birthplace of Mr. Rooster. I did , I have no regrets and I am honored to be a part of a family that does so much good for the special needs community. My family has become runners and I am too proud and love every moment. This is the direction my life should be going and there is no stopping me. Ainsley's Angels made a huge impact on my life. Love you all. Whenever I hear the word 'Testimonial', I think of church. A public recounting of a religious conversion or experience. The word 'testimony' is powerful ......It's like hearing a great sermon, listening to a pastor that delivers a message that is 'spot on' and directly intended for you. My story has been told, more than once..... I believe you all know how I got here. The testimony I share with you now is one that says, I followed my heart, you should follow yours. Believe in what you're doing and make sure that your drive is bigger and badder than anything that can knock you down. It's ok to be afraid as long as you keep moving forward. Believe in yourself, even if you're faking it..... and PRAY. We arrived to packet pickup the day before the race and actually got to MEET 'THE Ainsley Rossiter' I never held back with her.. I told her exactly how I felt about her... how much Ioved her and how much of an impact she made on my life. Together we took a million selfie shots and I think I gave her just as many kisses. The next day was race day..... I arrived early .... extra early.... I met my brother Tim Boyle on that cold and wet March morning and we were both in awe at the sight of the sea of 'freedom chairs' lined up for the morning race... there were at least 30 chairs! ~~ My name was on the list paired with a young man named Zachery..... I was excited to meet him and his parents and as the morning clock ticked, runners and riders arrived..... I ran around in circles looking for Zachery.... no one knew who he was or where he was.... as it got closer to race time, I started thinking Zachery was not going to come. In the middle of my final mad dash around the start area in search of my Angel Rider Zachery, Kim Rooster Rossiter grabbed my arm and stopped me.... He said, 'Come with me'.... I followed. Rooster talks fast, like me.... I like that..... He rattled off the details of a custom freedom chair presentation to Tim Boyle.... at the end of his instructions we found ourselves standing at the side door of the Rossiter family van... he slid the door open and there was Ainsley resting comfortably in the back.... he said with a smile, 'This is Zachery....... You are pushing Ainsley today' ~~ With my best and biggest smile.. with my heart full of love and admiration, The experience was above the 'real'.. I cherished each and every step.. Ainsley, I will never forget our race together. The next time we run, it will be hand in hand. I am not sure what prompted me to click the button and sign up to become an Ainsley’s Angel. I know I was nervous after submitting the form – the website states, “Do you have what it takes to be an Ainsley’s Angel?” As I stared at the computer I wondered, do I??? 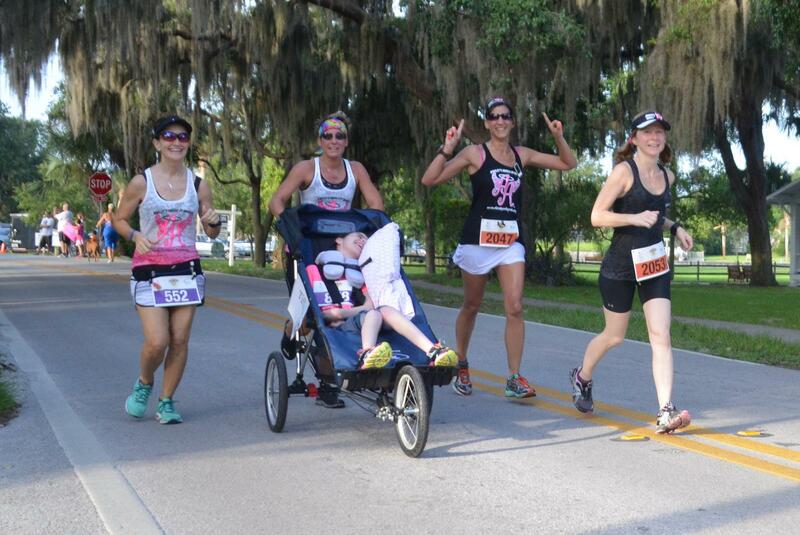 Hello Jill, I just received your registration for Ainsley's Angels in Florida!!!! So excited for you to join our team... you will be blessed in so many wonderful ways!!!!! Uh oh, it’s real now. My excitement and anxiety skyrocketed! Fast forward to April, 10th, 2016 - I just celebrated my one year anniversary as an Angel at the Iron Girl race in Clearwater, FL. It’s hard to imagine life without the Angels now as they have become an integral part of my life. I have met so many wonderfully kind, generous, thoughtful, gigantic hearted people plus all the kids and adult athlete riders whose smiles and laughter and chants to, “run faster” melt my heart. I never knew I could smile so much or soar so high! Feelings of euphoria surround every Angel event and leave me floating on cloud nine in the hours and days after! I never want to come down and I cannot wait for the next race. This endeavor allows me to enjoy something I love and give back. Reflecting on my time with the Angels, I realize I am the lucky one who has been blessed (as Jodi foreshadowed in our first communication). I lace up to challenge myself, my Angel Athlete and fellow Angels to create an amazing experience that will carry us to the finish line! I am hopelessly addicted and I LOVE every minute of it! We all have an inner Angel waiting to unfurl their wings. Thank you Run Jodi for freeing mine! Even so, I put my name on the IR4 list in October of 2014 to be matched with a buddy to run for. 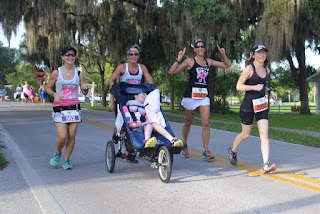 I also joined the Ainsley’s Angels in Florida group when my friend, Run Jodi Stoner, began its inception as Ambassador, even though I wasn’t entirely sure I was Ainsley’s Angel runner material. Then, in early January of 2015, when two biopsies confirmed that I have angiosarcoma, a rare cancer of the inner lining of blood vessels in my spleen, I backed away from both of those organizations, not knowing my future health-wise. I reluctantly asked the IR4 team to take my name off the waiting list, although I was very close to being matched then. I also dejectedly gave Run Jodi my AA things, thinking someone else could use them. Both groups were incredibly supportive of my decision – IR4 said they would put my name on a Medical Hold list and later on down the road, if I felt better, they would match me with a buddy. Run Jodi told me that she would hold my AA things for me and would give them back to me later – she was positive that I would be running with Ainsley’s Angels in FL some day, even though I wasn’t entirely sure myself. Amazingly and thankfully, I WAS able to run in the months that followed (which helped keep me positive), feeling well even with diminished stamina from the chemo, so I continued to run in races at a slow pace while cheering on my IR4 and Ainsley’s Angels friends. In September, 2015, after having gone through several chemo treatments and still running, I knew I could be a runner for an IR4 buddy, so I contacted IR4 and was soon matched with a remarkable 12 year old named Pete, whose kind mother was aware of my having cancer, yet still welcomed me as his runner. 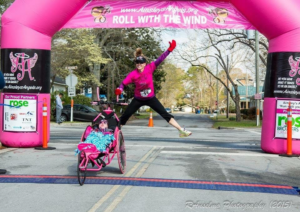 At the same time, I was ready to be part of Ainsley’s Angels, wearing the pink that symbolized so much, even if I wasn’t yet able to be teamed up with AA runners and riders; I would definitely slow everyone down! So after contacting Run Jodi, I signed up for the Run For the Fallen 10K that my Ainsley’s Angels friends were running, wearing my new AA tank top for my first race with them as an AA solo runner! From that point on I continued to run at my own pace in races, but now it was as a runner for Pete as well as a member of the Florida Ainsley’s Angels at races they ran in locally, including Run Jodi’s October 2015 Inaugural Ainsley’s Angels in Florida ½ Marathon! In April of this year, I signed up for a 10K race the Florida Angels were running up in Gainesville with the intent to once again run solo, but the night before the trip up to Gainesville I got a message from Run Jodi, asking if I would help push a rider that had just been added to the list in the 10K, alongside my friend (and Jodi’s husband), Gene. Jodi stressed that there would be no pressure to go fast; I could set the pace and Gene would be fine with that. To be able to earn my wings as part of an Ainsley’s Angels team, pushing a rider “Captain”, had me feeling both excited and petrified at the same time! The day of the race I met our sweet rider, a young boy named Marcos, who was going to be earning his Angel wings that day, too! 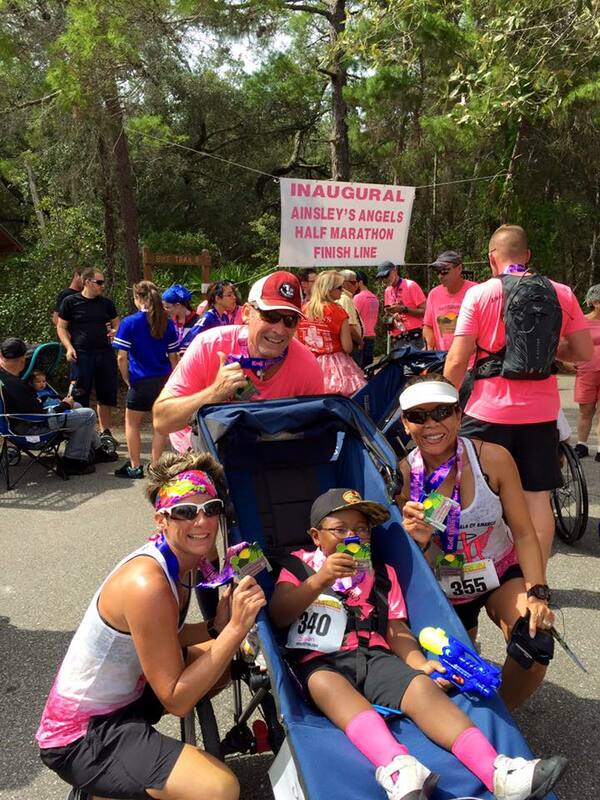 While running the race, Gene and I were joined by another Angel, Erica McElhinney, and the fact that Gene and Erica were willing to walk when I need to just touched my heart so – they wanted me and Marcos both to have a successful first time! 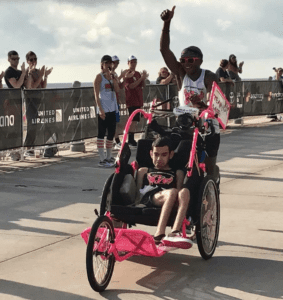 I can’t express the incredible feelings that I felt while pushing, then running alongside Marcos -- talking to him while hearing and seeing his own expressions of joy! -- then back to taking turns pushing, throughout the entire race! My heart swelled even bigger than it already was at the realization that I really was a member of an Ainsley’s Angels team, with Marcos pulling us jubilantly over the finish line! I still have cancer. I still run. But I have enormous support and prayer from family and friends, my CT scans show things remain stable (a very positive thing! ), and I am very thankful for so many things, including being able to run, having a wonderful buddy whom I can run for, and for Run Jodi and an amazing group called Ainsley’s Angels, who helped Marcos and me experience inclusion, and get our very own set of wings! Almost two years ago my father sent me a message that said, "I want M.j. to run in a 5k with me and your sister". I responded with "Haha, okay, but your skipping a few milestones"! You see, my son was born with cerebral palsy and at the age of 4 he was unable to walk, let alone run! I didn't question my fathers request. On the day of MJ'S first race, I packed his usual feeding supplies and toiletries and we made our way to the race co...urse still trying to figure out exactly what we were about to get ourselves into. The instructions we were given were simple; find the pink tent and meet us there. We were greeted warmly by Mitch and Connie Tiffany, our local ambassador and his wife. Right away Mitch jogged over to MJ, met MJ at eye level, and gave MJ a big hug introducing himself and connecting to my son. Instantly I knew this would be a lifelong friendship. As a special needs parent, you find that many people will ignore your children and speak to you first. It's a way for those who don't understand special needs to make themselves more comfortable in what they feel to be an awkward situation. Mitch and Connie and the rest of the local chapter never once did that. In that moment, it was all about MJ, something we had never experienced as a family before. Words cannot express the warmth, companionship, and friendship we have felt with our local chapter. MJ has participated in over 20 races and has a wall full of medals that even the most experienced runner would be impressed by. This organization has opened so many doors for MJ that I didn't believe was possible before we meet them. We have so much gratitude for the runners and guardians that make these events happen. Thank you Ainsley's Angels for making the impossible.....possible. For 17yrs I tried to find things for Gage to do. When he was born the doctor said, "never let his disability handicap your family." With 2 other kids doing everything from golf, soccer, gymnastics, cheer and softball there was always a side of me that hurt for Gage. I have taken him to games Etc only for him to sit, listen and have me hold him to try and keep him entertained. Because he can't see he gets nothing out of going to his siblings events without some kind of stimulation. When I heard Briley Rossiter read "Born an Angel" I was so moved. Ok I cried my eyes out!!! Then meeting the family, raising money for his chair in less than 2 weeks motivated me, my husband and his aid to get ready to push him. Since his 1st race seeing his excitement, smile and bond with others has not only given Gage something to look forward to and be involved in it has given us an extended FAMILY in Virginia. Individually the impact has been great too. 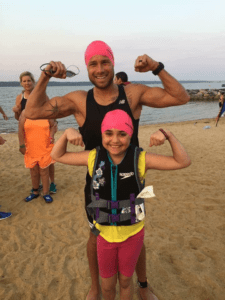 Jason Dougherty is training to start doing races with Gage, Sienna is volunteering with her team and for me... I'm ALWAYS talking, approaching others and have a sold out heart for not only the entire group but the family who started this journey for my family and want to spread that message!! Lastly.... 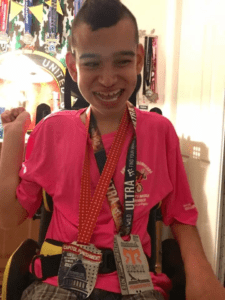 I am moved beyond words for all who are involved, run, hurt from running and devote so much time and money to push Gage and others across that finish line that have no direct connection (other than thru AAA) to special needs. God has a special place for you in heaven for sure!! UPDATE: Since my daughter Sienna was very young she has only considered being a vet when she grew up. Sienna was very small when her brother Gage was his sickest. So as she grew up whenever Gage was hospitalized it was more traumatic than normal. She's always been close to Gage and both of Gages siblings have been able to care for and even able to put his g-tube in for many years. Over the years there have been several ups and downs and times when I as a paren...t had to say no to going somewhere cause it would be to much for Gage and times when I took Gage and he was loud and maybe even a little embarrassing. Over the last year and our constant involvement with Ainsley's Angels, I have seen Sienna grow. This past weekend In Holland I watched Sienna go out of her way with so many of our athlete riders and friends. She's always had a big heart and a special place for special needs but it's become so much more. Over the last 6 months or so she has talked about a career involving special needs! I am so excited to see what path she chooses. I also want to thank all of the Ainsley's Angels of America and Team Hoyt families for their amazing children and loved ones that have touched my daughters life along with so many others!! ‪#‎Togetherweshall‬ make a difference!! 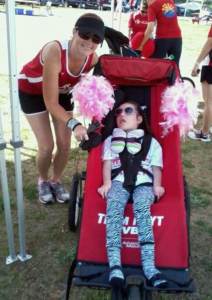 As an Ainsley's Angels family member and runner, every run is unique and exciting and every race has a special story. On Sunday, my race experience was perfect and magical. Katie and I flew down Bayshore Boulevard! We finished very happy! But it's the story of Angel Jill and Angel Rider Marshall that truly blessed us on that very hot winter day. The "Hot chocolate" race company tours the nation putting on race events that are hot chocolate th...emed. The race dates are always in the winter and they serve gallons of piping hot wonderful chocolate at the finish line party. On this particular sunny December day in Florida, we needed chocolate ice cream!! It was hot, unseasonably HOT nearing the mid 80° mark with high humidity on a course with ZERO shade. A minor change in plans had Angel Jill pushing Angel Rider Marshall ....solo. Now, I'm just going to be honest… Angel Rider Marshall is a big strapping man and Angel Jill, well, she's tough… But she's petite. The race started and we all took off. I saw Team Marshall during the race and even though we didn't have a chance to talk, We shared a wave and a smile and yelled the word 'ANGEL' as we saw each other on the course. I was hoping Jill was able to communicate with Marshall. You see, for most of us, speech is automatic… But not for Marshall. Due to his cerebral palsy, he lacks the fine motor skills to pronounce certain sounds. He has to focus much harder on each sound and constantly focus on trying to speak. So, speaking requires a fair amount of effort for Marshall. As Marshall and Jill approached the 9 mile mark, with .3 miles left in this 15k event, a drawbridge was the only thing that stood in their way of the finish line. As they started up the hill, the heat, humidity and fatigue really hit Jill hard. Jill told Marshall that she was fading as her pace slowed. There was a moment of silence and then Marshall spoke. He talked slow and steady. He spoke each word separately and with intention. He wanted to make sure she heard what he was about to say. He said, "YOU....GOT....THIS.... JILL… I... .KNOW .....YOU ....CAN ....DO ....IT!" Jill later told me that when she heard those words she dug her shoes into the pavement and pushed with everything she had to get up and over that bridge. When she felt she had nothing left, it was Marshall's spirit and strength that pulled them. This is the true meaning of teamwork and 'Ainsley's Angels'. It's the true meaning of "Together We Shall"! I’m a firm believer that everything happens for a reason -- Always have and always will. Running saved my life and running now is my life. Rewind to January 2011 – I was at the lowest possible place in my life. It was two years post-college and I decided to move back to my hometown. “Go back to your roots to regroup and get your old self back” I told myself. Prior to moving back home, in Fall 2010 my roommate in Baltimore asked me to run a half marathon with her. As a retired Division 1 athlete (who was probably up 25lbs post graduation), I said “sure” and thought it was a great idea to sign up… and not train. With a max 6 miles under my belt, I struggled 13.1 hilly miles in the Blue & Grey Half Marathon in Virginia. Despite the pain, I got the running bug. It turned into my happy place, it still is my happy place. It made Amanda her old self again. When I moved back to my hometown I asked myself what was my purpose in life? “I’m an athlete” I answered…well not anymore, you’re an old washed up athlete, think harder. Okay…so I asked myself again, what can I do with the sport I love AND give back to someone in the community? Right then and there I signed up to be a Cross Country Coach with our local Special Olympics team. Fast forward to 2014 – four years later, running was now “my thing!” If you followed me on social media, you knew that. 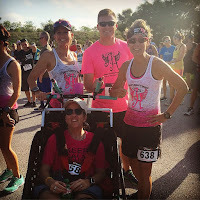 My girlfriend Ashley Johnson approached me and said “Hey, my aunt told me about this group called I Run 4, they pair runners with individuals who have special needs. She had her son Callen join the group, he’s waiting for a runner.” Wow, sounded intense, and the Facebook page seemed intense. 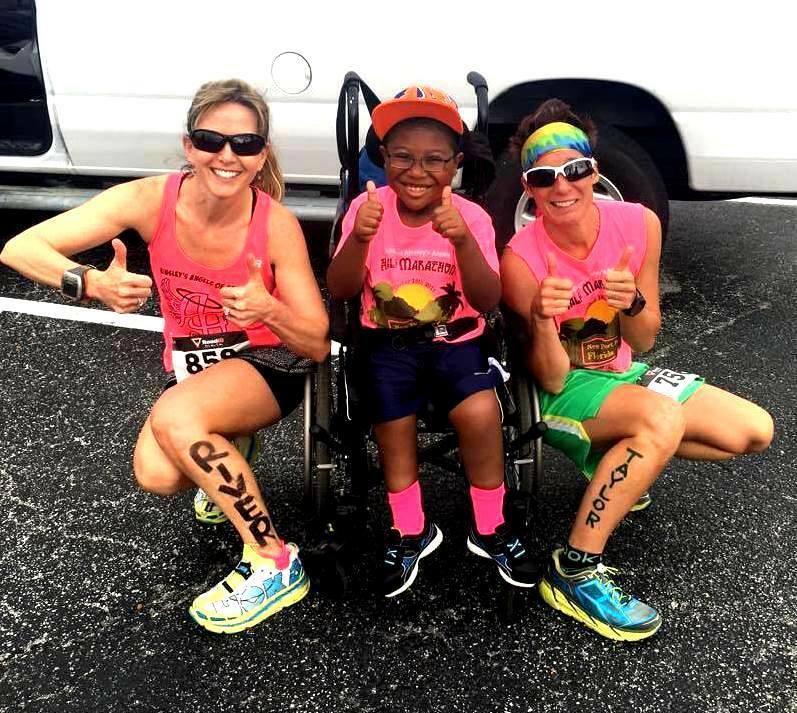 Some lady named “Run Jodi Stoner was popping up in my newsfeed EVERY day doing jumps and running crazy miles for this little boy named River. As I watched her excitement and joy I told myself, “I want my own River.” I officially signed up. And then it happened, after 6 LONG months of waiting – I thought I’d get a buddy from California or Florida, somewhere “cool” compared to Pennsylvania. Well my wish came true, I got someone “awesome”, his name was Liam and he lives in IRELAND! Pam Dennehy (WHATTTTT!!!) 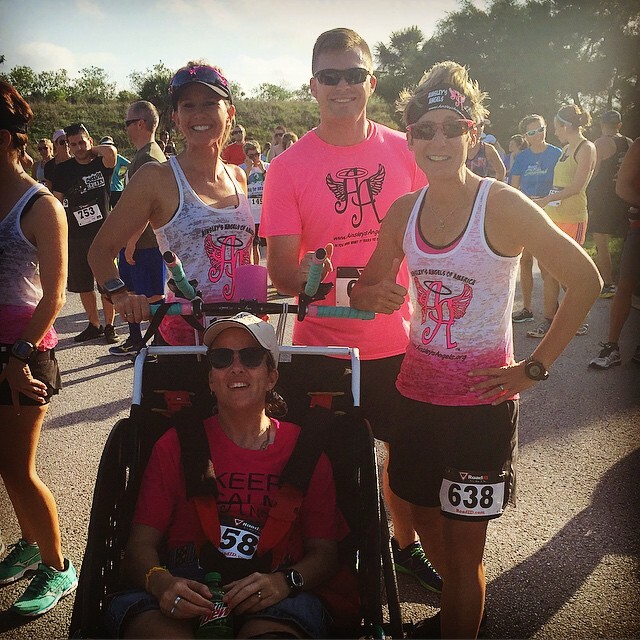 It was then on August 1, 2014 – I found my purpose in life… I am supposed to be supporting others…to use my legs for them, but more importantly, share my heart with them. Fast forward to October 2015 – with a lump in my throat I typed up a long email to this guy named "Rooster" Kim Rooster Rossiter who is apart of Ainsley’s Angels. I’d seen them for well over a year now on the IR4 page and my friend Elice Johnson has an I Run 4 buddy, Lanie Warner who is with AA. If anyone could help me, I knew he could help make my dream come true, he would maybe let me borrow a chariot to bring to Ireland to race with Liam as I just booked a plane ticket to visit he and his family. Three hours later an incoming call from Virginia Beach popped up on my iPhone and my life forever changed. While I think Rooster can sell a popsicle to a woman in white gloves, Rooster didn’t “sell” me that afternoon on the phone, he made me realize why I’m here in this world, which is what I thought, to support others. My mind new the answer as soon as he asked, but in less than 24 hours my mind made up the decision, I WILL bring inclusion to Southeastern PA. Forward to present day – my life and heart is now full. Coming FULL circle, my first rider in SEPA was Callen, the little boy/family who introduced me to IR4 and my first Angels were Ashley and Elice. I have an AAmazing family I would have NEVER imagined having if you asked me 5 years ago. Every day and every hour my life is full of smiling runners and riders and the most exciting aspect, this is just the START of SEPA. We’re a young and fresh ambassadorship and the future holds endless options. I helped make a dream come true in Ireland (and mine was made) and I’m also helping dreams come true in SEPA. Ainsley’s Angels has forever changed my life and I thank all of YOU for that! I wanted to take a moment today and thank you, thank you for the gift that is Ainsley's Angels. You have given Stacia a gift that means the world to me as her mom. By sharing your sweet daughter with all of us you have shown my daughter the power of Rolling With The Wind, you've showed her the warmth of inclusion and you've showed her the gift of never giving up. Having someone mention Ainsley's Angels to us last year when she was in the hospital and we were dealing with an Ng feeding tube and she was entering a level of depression no one should have to feel I was struggling as her mom to find something to give her joy. She felt like her body was failing her and to some degree she may have felt I was failing her because as her mom I'm supposed to fix it and make it all better. I didn't know what to do to bring her smile back. Then one of her treatment team mentioned this thing they'd heard of called Ainsley's Angels, they said contact them its worth a shot. Get her out there, get her involved, don't let her give up. So I did, and that was the best thing I could have ever done for her. Her smile the first time she sat in a chair was so amazing. I saw Miss Stacia's smile something I had been missing for quite awhile. As her body has continued to make day to day things more difficult for her and she had to take a break from the game of golf, something she has loved for 2 years she tells me that it's okay because she still has racing. Watching her excitement as we sat down and started marking races down in the calendar for 2017 all I could do was smile. Even with the bumps in the road I know are coming your gift of AA will keep her spirits lifted. My little girl was always very different from her peers. I remember when her preschool teacher called me in for a parent/teacher conference concerned about her behavior. "she spends most of her play time alone in the sandbox and gets upset when she is asked to interact with the other children." Fast forward to the age of 12, after being given multiple false diagnoses: ADHD, Depression, Oppositional Defiant Disorder, Anxiety, Learning Disabled.....and given the medications to go with those diagnoses. Thank God I don't just take a doctors word as law. Something was not right about what they what they were treating her with. I pulled her off of all medication (it made her aggressive) and did a bunch of research. I found a possible answer and made an appointment with a specialist. Sara had Asbergers Autism, and NONE of the other diagnoses she was previously given. After having years of IEP meetings, fighting for inclusion, psychiatric appointments and frustration, Sara graduated in the top 25% of her highschool class and headed to Auburn University where she studied Wildlife Ecology and Management, and lived independently for two years. Then, she became extremely ill. The past four years she has suffered from serious gastrointestinal distress. Gastroparesis caused a 70 pound weight loss and she almost died. After a year and a half of a feeding tube, her stomach began to work again. She began to improve, only to find that now she has a Mitochondrial Disorder and her systems don't work at the cellular level. This causes extreme abdominal pain and nausea 24/7, 365 days a year. Imagine if you will having the flu...ALWAYS. That background is needed for the testimonial...thank you for your patience as I lead up to what Ainsley's Angels means for us all. Sara Kissick overcame insurmountable odds to successfully become independent over the course of her life. Since becoming ill and having to leave Auburn on a Medical Withdrawl, she has spiraled out of control psychologically. She had all but given up on having a quality life, and spent most days in her bed, watching videos and playing video games. She is now disabled and lives at home at the age of 24. This organization was something I joined to help other children initially. In return, it has given my hope back and allowed my daughter to feel included back in the world...away from the doctors visits, the hospital stays, the endless tests, the feeding tube, and the medication. During Run the Bluegrass last weekend, my daughter got out of the chariot at mile 12. She walked, ran, and then sprinted to the finish just like she had in high school when she ran cross country. The look on her face tells this WHOLE story with one expression. She is fighting for her life again. Without this organization, and her involvement in it. She would still be in the bed. She has been accepted to University of Kentucky recently, and plans to return to college in the fall. She is taking her life back, pain and all. She is accepting her symptoms and starting to learn coping skills to deal with them. If she can do a half marathon, she can finish college. April 30th, she will do her first full marathon. The sky is the limit! Angel Athlete Rider Emily joined for the inclusion, stayed for the family. I love that AA Gives me something, greater than myself, to be a part of. The opportunities being part of this family has given me to advocate and educate have filled me with pride and a different kind of confidence I didn't know I had. To make a difference, inspiration and motivation. Love to see the smiles but also love to know that I can make a difference in someone's life. In a world full of negative, it's great to see the positive! Never take the little things for granted. Share your blessings! It's as easy as sharing your legs! In fact, my 14 year old son shared his legs for the first time last month; proud momma moment! What drives me is to see the smile on the face of our Angel.. the pride beaming from the parent's faces as they cross the finish line, or the high fives.. the moment when I was allowed the privilege to cross the finish line together with my very first AAMAZING Team (#Team Matthew) will forever inspire me. The sheer determination in Matthew's face walking across the finish line after riding with what started out as strangers and ended with a new family's tears of joy- Why would I NOT want to be part of this! Being a part of something bigger than myself was never anything I planned. The joy on Ainsley's face at her first race, watching my family rallying around something that included people that could never do this on their own two feet and feeling the excitement of the race through a photo changed my life! It's not possible to put into words the fillings you get when you experience what we do. I do not like running and I am not fast...I love pushing someone that doesn't have the ability to run and letting my legs create a moment in time that my angel rider is in control, that they can feel free... that they can do anything!! Watching people across the country run together day after day showing love to others, bringing awareness to the special needs community and wearing our sweet Ainsley's name across their chest isn't something that can be put into words..I am so grateful and we are so blessed! Everybody in life deserves to be needed. Everybody in life deserves to be loved. Everybody in life deserves to be treated with dignity. Everybody in life deserves to be included. You see our family are strong believers that God has an ultimate plan for your life and nothing happens by accident. Everything is ordained and all pathways that He plans for you are ones that are perfectly orchestrated. It took 18 years for his plan for our Mollie to fall into place and it was so worth it. Every tea, every heartache, every doctor visit, every shunned moment, every question, and every moment of isolation was worth it to get to the point where God wanted us involved with Ainsley's Angels. To never have to apologize for the way things are, to have eye contact with other people who understand what you were saying without ever having to say a word to have people stop and have a conversation with your child even though they don't talk back, to have people that love us that really don't even know us....makes it all worth it. All 18 years of waiting for Mollie's purpose to be made clear. What a joy and honor it has been so far to have been placed in the pathway of Ainsley's family. Oh what a great and glorious God we serve! I can honestly say suffering has never been so wonderful as it has been for the pst four years. We wouldn't trade it for anything in the world! Together we shall and together we will continue! So why? Because others answered why not to us... And that is what life is all about. Four years ago, our Athlete Riders would be at their homes right now watching TV going through their daily treatments trying to figure out what Saturday is going to bring. That's not a question on Ainsleys's Angels race day! When we started on this journey, we knew the key rested with pure execution, amazing people, and positivity. 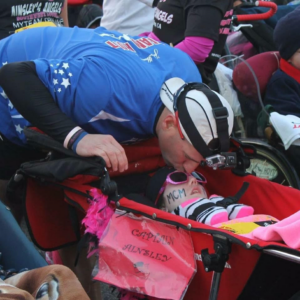 As we continue this journey, it is moments like this at the start of the 2017 Ainsley's Angels Race Series that reinforces success and smothers negativity and celebrates joy! I'm here for the judgment free moments during the times that are hard or unusual (you know, Ashton pacing around the perimeter of a room during a presentation comes to mind). The fact that Ashton can be absolutely who he is and is celebrated for it. I'm here for the sense of family and knowing that someone is always there....non of our journeys are the same, but they're not dissimilar either. Because it gives me the opportunity to share something with my son Pedro that I am passionate about, running. I push, he riders. For him it is an opportunity to be part of an athletic community. An opportunity to ride, to cheer, to inspire, to promote inclusion and to have fun with others. He is also an Ainsley's Ultra Ragnarian! As we're on this journey with Eric we became part of the Ainsley's Angels family because of the joy and acceptance it brings into his life. We know time is a precious gift and to make joyful memories with this amazing family has made a huge impact on how he faces his days. AAA has wrapped the love around each and every member of our family with acceptance,support, and encouragement. It's made all our family strive to find our own WHY and find our own PRIME. For many ears, I had been stuck in a rut. I was 100lbs over weight. I had lost all of that through diet and exercise (mostly running). When I joined the Ainsley's Angels family, I had been looking for something to motivate me. I did not want to go backwards to that old me. Ainsley's Angels has successfully offered that motivation. I look forward to race day almost as much as our Athlete Rider and their families. It is amazing to see some of the changes that occur out on that course. Our athlete rider's all open up and communicate in their own special way that many people miss when they are just going through a normal day. Am I motivated - ABSOLUTELY! God has blessed me beyond measure. Thank you Ainsley for being our inspiration! Thank you Ainsley's family for sharing her passion with us! I joined Ainsley's Angels because I wanted to become a part of something bigger than myself. Ainsley's is about uplifting, loving, and supporting others. It's about inclusion and hope. The folks that I've met through this program (both riders and runners alike) have taught me that life has a hopeful undertone. And I am so beyond grateful for the experiences I have been a part of since joining this family. The opportunity for Hunter to be loved and accepted just as she is, and for her to be included in activities without a second thought. While she was always accepted at church, school and even sometimes youth group activities where a different story. Having been a part of AA for over two years now, we have not only experienced acceptance and inclusion, but have been blessed with a widely diverse family across the country. Because it changed my wife's and my lives! I sat on the sideline for a year watching the smile on my wife's face, as well as the faces of the other riders! I wanted to run with my wife, but being 242lbs and non-athletic, I didn't think I would be able to. February 2017, as I watched my wife cross the finish line, I told myself, I was going to give it everything I've got to be fit enough to push her! I set a goal to run a 5K in May and to be at or under 200lbs! As of race day I was at the 200lb mark and pushed my wife in our first race with the time of 30.03! I was hooked and knew I wanted to be a part of this family for life! I'm now down to 170lbs and run a minimum of 1 mile a day! Now that we have a running chair, we can spend a lot more time outdoors doing what we both love to do! Thank you for giving us the opportunity to be a part of this amazing family!